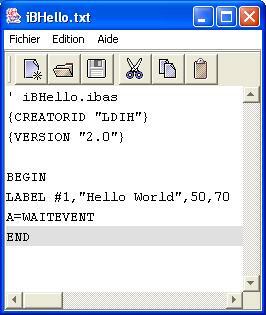 iziBasic is a low-cost, easy-to-learn BASIC compiler that lets you quickly create programs right on your PalmOS device, even if you're new to programming. This wiki is a place to share iziBasic information and code. To contribute, please contact us for the wiki password. To download iziBasic itself, please visit the official iziBasic web site . Very glad that you are adding the French translations. Maybe now as I compare to text from the two sites I can learn a bit of you and Aldweb's native language :). I've started the French versions of some topics : I have made the "Index" page and the "Overview of iziBasic" page in French. J'ai commencé les versions françaises de quelques pages : j'ai fait la page "Index" et la page "Présentation de iziBasic" en Français. I've made the Memo Pad page. If you see some mistakes, you can correct the page, if you want. I've added screenshots to the PIAF page, and I have made the "Picking Tools" page. The wiki progress rapidly ! PS : I will also try to translate some pages to French. It's really great to see things getting started here and to read the initial content, about iziBasic's UI. You can even include images to help users' understanding. Your revisions look good. You actually beat me to the punch, was just on my way over here to add the list with goals and topics. Thanks again for helping with the project. Happy adding/editing. Tried making some revisions to the home page. Let me know what you think. Also, added a page to track our ideas for wiki organization. Does this wiki software have a way of rolling back revisions? Permission is granted to copy, distribute and/or modify this document under the terms of the GNU Free Documentation License, Version 1.1 or any later version published by the Free Software Foundation. If you don't agree please don't add content.